I was recently asked whether you have to search for your ball before putting another ball in play or continuing play with a provisional ball. The simple answer is, “No, you do not”. If a player thinks that their ball may have come to rest in a position where they would be unable to play it, or if they could it might take them several strokes to get back onto the fairway, then they can play another ball (without calling it a provisional ball) from where they last played, under penalty of stroke and distance, Rule 27-1. However, if anyone finds the player’s ball in bounds before they have put another ball in play then the player has to proceed with that original ball. At a par-3 hole, a player hits his tee shot into dense woods. He then hits a provisional ball which comes to rest near the hole. In view of the position of the provisional ball, the player does not wish to find his original ball. He does not search for it and walks directly towards his provisional ball to continue play with it. His opponent (or fellow-competitor) believes it would be beneficial to him if the original ball were found. May the opponent (or fellow-competitor) search for the player's ball? A. Yes. In equity (Rule 1-4), he may search for five minutes provided that in the meantime the player does not play a stroke with the provisional ball, it being nearer the hole than the place where the original ball is likely to be. The player is entitled to play such a stroke. If he does, the original ball is then lost under Rule 27-2b and further search for it would serve no purpose. In match play, if the player so proceeds and his provisional ball is closer to the hole than his opponent's ball, his opponent may recall the stroke (Rule 10-1c). However, recalling the stroke would not change the status of the original ball, which was lost when the provisional ball was played out of turn. If a player wants to play a provisional ball they must do so before they or their partner go forward to search for their original ball (Rule 27-2). 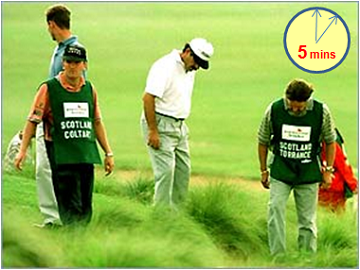 The five minutes that is permitted to search for a ball commences as soon as the player, their partner, or either of their caddies have begun to search for it (Definition of Lost Ball). Time spent in playing a wrong ball is not counted in the five-minute period allowed for search (Definition of Lost Ball). A player is allowed five minutes to search for their original ball and another five minutes to search for their provisional ball, providing both balls are not believed to be so close together that, in effect, both balls would be searched for simultaneously (Decision 27-4). If a player finds their ball after two minutes leaves the area to get a club and is then unable to find the ball again, they are allowed three minutes (being the balance of five minutes) for further search (Decision 27/2). If a ball that is believed to be a player’s original ball is found in bounds the player must inspect it and, if it is their original ball, they must continue play with it (or proceed under the unplayable ball Rule), abandoning any provisional ball (Decision 27-2c/2). If any reader who has not yet subscribed to my weekly ‘Rhodes Rules School’ series would like to see an example before subscribing please email me at rules at barryrhodes dot com. However, I would remind you that this weekly series, where I pose several Q&As based around photos of situations that players regularly encounter on the course, is sent without charge and you can unsubscribe at any time. I promise that I will not pass on your email address to anyone else. Click on this link now to subscribe. Excellent service and the pictures are fantastic! Who determined the five minutes ? The Rules do not specify who keeps the time, but it is obviously the player's responsibility, because if they play the ball more than 5 minutes after search had begun for it, they will have played a wrong ball and will be disqualified if the marker, or anyone else, brings factual evidence of this breach to the Committee's attention.